The JCP XC and Track Hall of Fame recognizes elite athletes who have achieved exceptional athletic success while exhibiting our team motto of "Class, Pride and Character." Jamison was the first athlete in Jones College Prep history to achieve All State status when he placed 19th in the IHSA AA State Cross Country meet as a sophomore in 2010. He achieved All State status a total of 7 times (3 in XC, 4 in track). He set school records in the 800, 1600 and 3200m runs as well as running legs on record-setting 4x400 and 4x800m relay teams in track and in the 3 mile run in cross country. Jamison led the Eagles to their first regional, sectional and state titles. He was a 6 time City Champion (XC twice, 1600m run twice, 3200m run, 4x800m relay) and 3 time Sectional Champion (XC, 1600m run, 3200m run). At the time of graduation he held the IHSA AA State Meet Record in the 1600m run, the CPS All-Time 1600m and 3200m records, the Chicago Public League Cross Country Meet record, and was a part of the Chicago Public League Championship Meet 4x800m relay record. Jamison was also the first Jones athlete to sign a National Letter of Intent to accept an athletic scholarship at a NCAA Division 1 university when he signed with Loyola University of Chicago. Jamison ran high school personal bests of 1:52.8 (relay split) in the 800m run, 4:11.99 in the 1600m run, 9:07.04c in the 3200m run (9:10.63 for full 2 miles) and 14:43 in the 3 mile run. Kirby was the heart and soul of Jones first ever state championship cross country team and set the tone for the team with his famous "make it or take it" philosophy. Known for his patriotism, fiery spirit and historic quotes, Kirby was Jones' third All State athlete and third sub-15 3 miler. He was the top #3 man in Illinois in 2013 and a crucial part of winning the state title. In addition to his All State accolades, Kirby was All Sectional 5 times (XC 3 times, 3200m twice) and All City 4 times (XC twice, 3200m twice). At the time of graduation Kirby was #7 all time in school history in the 1600m run and #3 all-time in the 3200m and 3 mile runs. Kirby went on to Butler University in Indiana. Kirby ran high school personal bests of 2:04.4 in the 800m run, 4:31.20 in the 1600m run, 9:33.37 in the 3200m run and 14:53 in the 3 mile run. 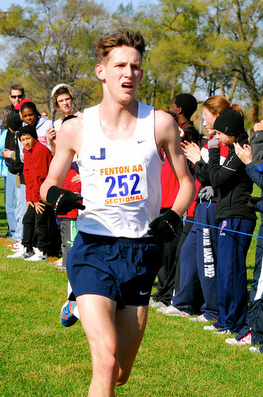 Luke was the second Jones athlete to achieve All State honors in 2012 when he placed 5th in the IHSA AA 3200m run. He followed that up with an 8th place All State finish in the 2012 IHSA State Cross country meet, helping lead Jones to the state title. Luke achieved All State status two times (XC and 3200m run) All Sectional status 7 times and All City 6 times. At the time of graduation he was 7th all time on the historic Fenton Cross Country course. As a part of Chicago XC club he finished 23rd at the Nike Midwest regional. At the time of graduation Luke was 2nd all time in the 3 mile, 1600m and 3200m runs. In addition to his many running accomplishments, Luke was awarded the Running Eagle Award recognizing his 4 years of outstanding commitment to Class, Pride and Character. 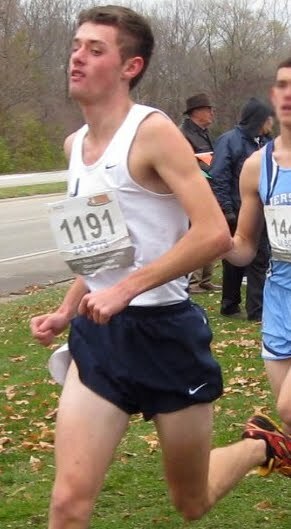 Luke went on to Tufts University in Massachussetts where he was a Division III All-American in the steeplechase. Luke ran high school personal bests of 2:01.13 in the 800m run, 4:19.54c in the 1600m run (4:21.52 for the full mile), 9:24.32 in the 3200m run and 14:45 in the 3 mile run. Arthur was Jones' first ever All State athlete in the 800 meter run, when he finished 5th in the 2017 IHSA State Track Meet, lowering his own school record to 1:54.39. 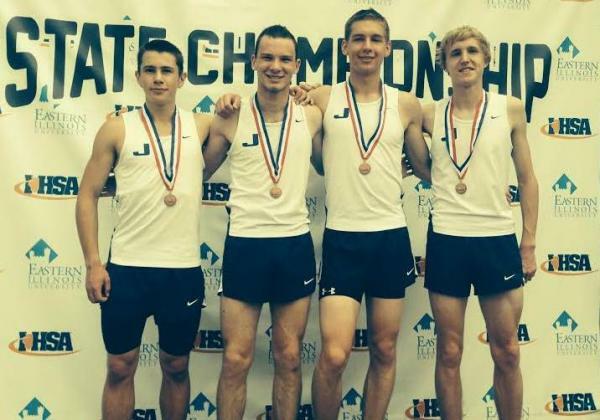 It was Santoro's second All-State finish after leading off Jones' 2015 6th place 4x800 team. 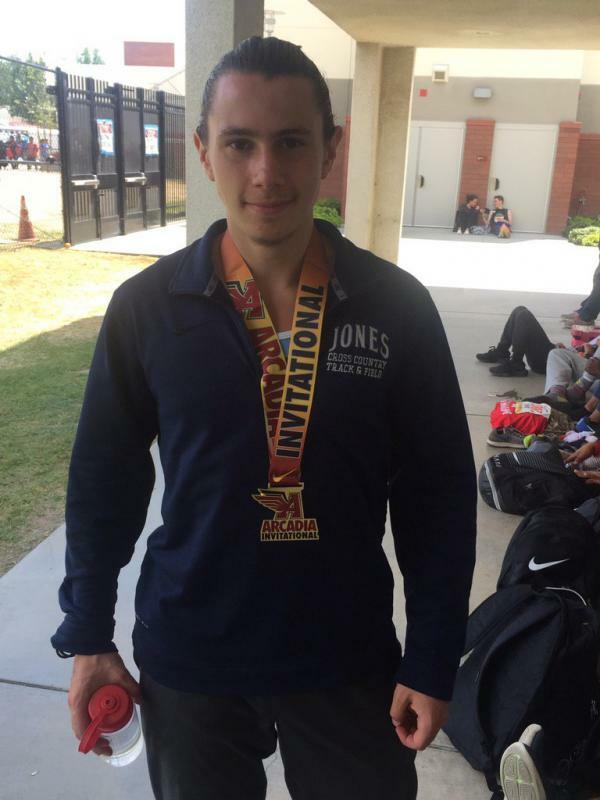 As a senior Santoro also won his heat of the prestigious Arcadia Invitational, as well as the 800 meter championship at the elite Distance Night in Palatine. He was also the CPS champion in the 400 meter dash. At the time of graduation Arthur was the school record holder in the 200, 400, 600, 800, 4x400, and 4x800 indoors and the 200, 400, 800 and 4x800 outdoors. Arthur went on to attend Knox College. Arthur ran personal bests of 23.77 in the 200m dash, 50.46 in the 400m dash, 1:54.39 in the 800m run and 4:24.64 in the 1600m run. Peter was the fourth All State athlete in Jones history when he finished 10th in the 2013 IHSA State Cross Country Meet. He was the top 4th man in the state his junior year, when he played an integral part in bringing home Jones' first ever state championship in any sport. Peter was city and sectional champion his senior year in both XC and the 3200 meter run in addition to finishing 2nd at the prestigious Indoor Prep Top Times meet. At the time of graduation Peter was the school record holder in the indoor 3200 meter run, 2nd all time in the overall 3200 meter run, 4th all time in the 1600 meter run and 6th all time in the 800 meter run and 4th all time in cross country. Peter ran high school personal bests of 2:01.13 in the 800m run, 4:24.66 in the 1600m run, 9:24.14 in the 3200m run and 15:05 in the 3 mile run. The quartet of Santoro, Maloney, Protsiv and Sarchet produced the 3 fastest 4x8 times in school history (as of 2015) and became the first Jones relay squad to break 7:50, which they accomplished twice. The boys broke out at the Sectional Championship, where they bested the field in a school record 7:48.55, 11 seconds faster than they had run previously. The following week in Charleston they qualified for finals with a 7:51.00, becoming the first relay squad in Jones history to run in the finals portion of the IHSA state meet. At finals they ran 7:49.81 to place 6th and earn All State honors. All 4 relay members ran personal best times in one of the 3 races: Sophomore Arthur Santoro split 1:58.5, Senior Kyle Maloney split 1:57.2, Senior Markiyan Protsiv split 1:55.0 and Senior Captain Will Sarchet split 1:55.9.